Shooting with a long zoom or telephoto lens is a challenging task, but the dramatic photos (hawk, tiger, peacock) you get are often worth the effort. The problem is that a good lens in the 300mm range or longer tends to be big , heavy , and unwieldy . Bringing one along on a hike is not something one would want to do…until now. The folks at Kata Bags (our favorite camera bag company) have designed a few backpacks (TLB-300 PL, TLB-600 PL) specifically for photographers who wish they could take their monster lens with them on their treks. Today we are going to take a FirstLook at the Kata TLB-300 PL. 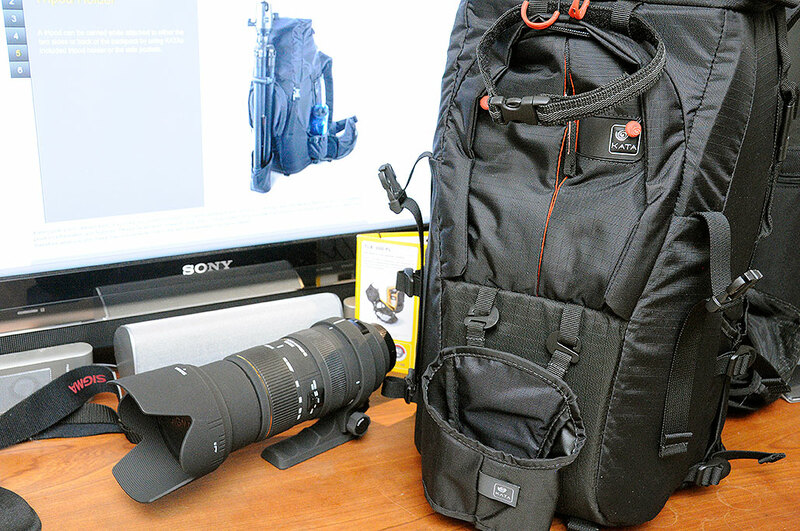 The TLB-300 PL is a special purpose bag designed to safely transport a long telephoto lens with a body attached. Like other Kata bags built to carry large camera equipment, this bag is well padded and offers substantial protection for the gear inside it. However, unlike those bags, this one was designed as a backpack. Similar to a large backpack, this backpack has an internal frame, comfortable shoulder straps, and a waist belt. Unlike a large camping backpack, this unit is not a top-loader. This pack was designed to unzip quickly and opens up fully to allow quick access to the gear. 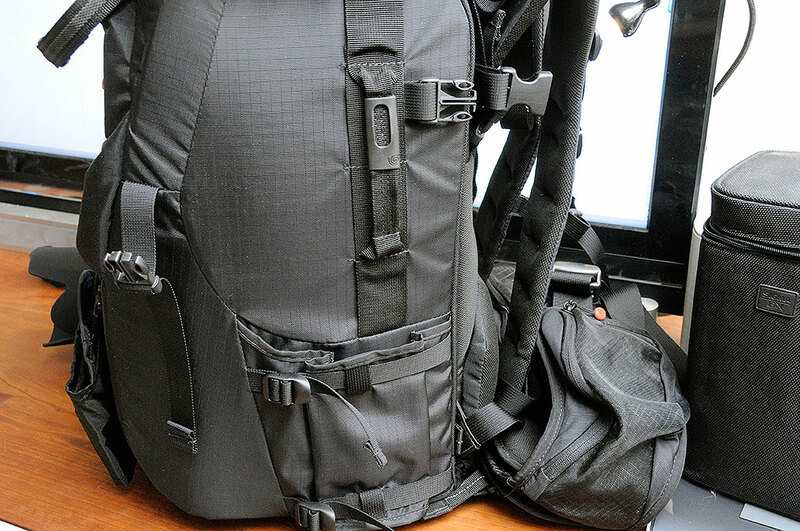 The Kata TLB-300 PL backpack’s internal compartment is over 18″ in length. It is long enough to accommodate most 300mm telephoto lens with a camera body attached. 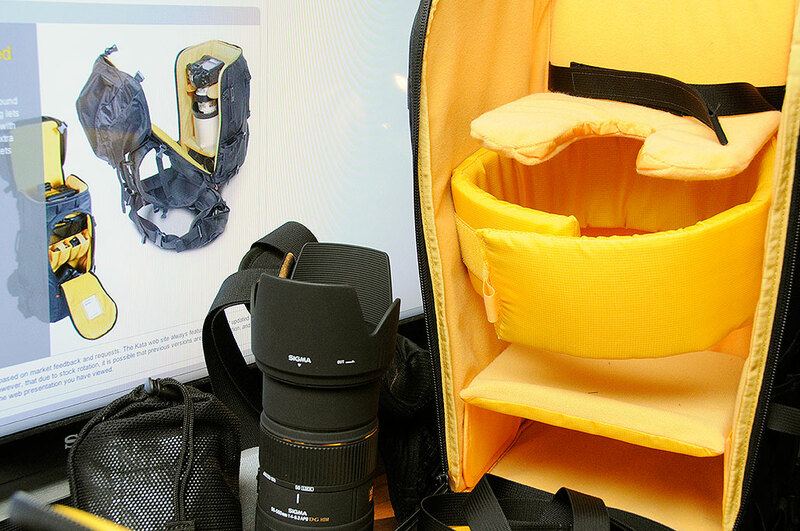 The cutout in the upper pad is so the camera body and lens may be cradled and protected while in the bag. The rear of the pack unzips and opens up completely. This design enables the entire assembly to be lifted out as a unit from the bag quickly and securely. Note the platform near the bottom of the bag. This horizontal platform may be moved up/down vertically to better support the lens being carried. If the main lens is short, a second lens may be stowed horizontally in the space underneath. There are additional storage pockets and pouches at the side, front, and top of the pack. The front pouches are two layers deep. The shallower one is perfect for stowing smaller, flatter items (memory cards, batteries, etc) while the deeper one is sized for larger, bulkier gear (adapters, chargers, etc.) The top pouch is very roomy and large enough for a fleece jacket or other personal items. A full-pack cover is included for both rain and heat protection. The water-proof coverhas a silver side to reflect the sun in order to keep the contents of the pack cool when out on a bright day. 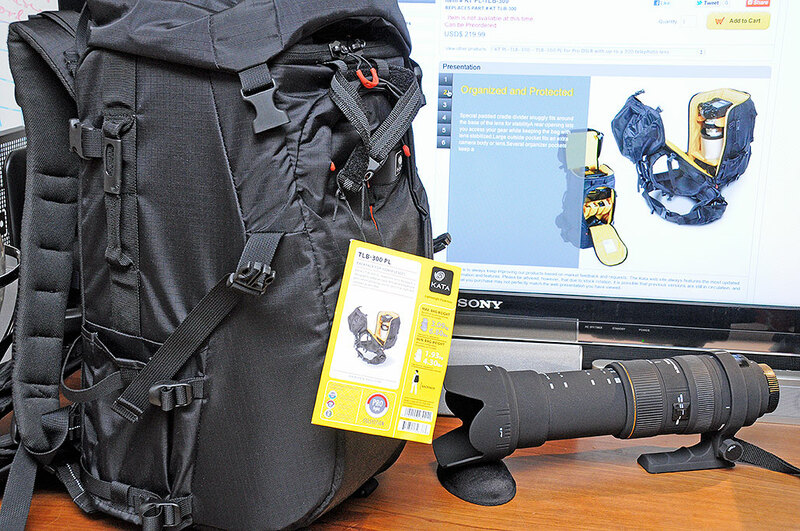 As a long lens often requires the use of a tripod, the pack also comes with a tripod sling which may be attached to either the front or side of the bag. A fully loaded pack can be quite heavy. Even weight distribution is the key to making the pack comfortable and easy to carry. Padded straps will make it easier on the shoulder, but a well-fitting waist belt is essential for proper load-balancing. The waist belt on the Kata TLB-300 PL is the most adjustable harness we have seen on a camera pack. Most should be able to adjust it for an optimal fit. The Kata designers recognize that a large pack like the TLP-300 requires sturdy and easily accessible grab handles at various points on the bag. Sewn onto both the left and right sides are reinforced grips exactly where you would expect. It is these extra touches which separate a Kata product from the rest. We will load up the backpack and take it out for a quick spin locally for the FirstUse report. There are a few nature-oriented hikes planned for the Summer and we will definitely take this bag along for a more extensive field test. We hope to have some comments on its performance out InTheWild by the end of Fall. Look for the write-up later in the year.